In the past couple of days I’ve gotten some new fabric in the mail. I ordered these fat quarters from Art School Drop Out a while back, and they came this week. I love them! Pennington Quilt Works had a 20% off sale last weekend, and I took advantage of it. Those goodies arrived the other day, too. From left to right: two prints from the Riley Blake “Wheels” collection, the whales from Cosmo Cricket’s “Snorkel” collection for Andover, a print from the “Wild Thyme” collection by Carolyn Gavin, and 3 prints from Heather Bailey’s “Nicey Jane” collection for Free Spirit. 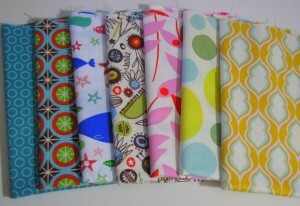 Now if only I could finish the darn rainbow quilt and cut into all this goodness!